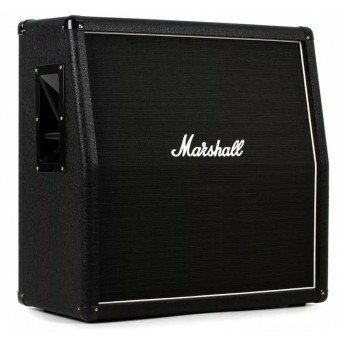 The Marshall MX412AR is the perfect complement to your DSL100HR head. This angled 4 x 12" extension cabinet is loaded with a quartet of Celestion G12E-60 speakers, which yield a muscular British sound with open cleans, brutal crunch, and singing leads. On top of that, its angled speaker baffle delivers maximum sound projection. Hook it up, and you'll experience full lows, creamy mids, and chiming highs. No matter what style of music you're playing, the MX412AR will bring out the best in your amplifier. Complete with the iconic Marshall logo, the MX412AR is a great way to expand your DSL's capabilities. Celestion's G12E-60 gives you classic British tone, with enough power handling for today's powerhouse amps. In the 1960s, Celestion's original Greenback speakers helped shape generations of guitar tone and became a staple of modern music. With its warmth and distinctive growl, the G12E-60 serves up the essence of British guitar tone, with low-end grunt complementing its warm mids, crunchy upper-mids, and sweet highs. When we're searching for the definitive Celestion sound here at Sweetwater, we reach for the G12E-60.